Do you have a wet basement floor? Well, you are not alone. One survey says that 60% of all homes deal with a wet basement floor not just once but many times in the course of a decade. This is the average time that a new and completely dry basement has before it deteriorates; many homeowners even complain of experiencing damage even before the ten years lapse. That said, rest assured that there are plenty of ways for you to solve the problem. Read on to find out the best basement framing tips. There are many reasons why you should consider framing or finishing a basement yourself, but perhaps the best one is to save money. No doubt about it: the average cost to finish a basement professionally can set you back thousands of dollars. If you think you have the basic know-how, then it would be wise to try to do things on your own before calling the pros. Now, the starting point for every basement project is a dry space. The thing is, even newly-finished basements can face moisture problems with every change in weather and season. Floor insulation is a must to treat a wet basement floor. Carpeting is one of the most common options for this: just roll a thick, clean and dry carpet out and you’re good to go. However, carpeting is not really considered a permanent solution; it is usually done for aesthetic purposes. Moisture can still occur especially if the floor surface is exposed to the cold. To solve this, prepare a layer of polystyrene foam, about one-and-a-half- to two-inch thick, and place it on the concrete. Set a layer of plywood, about five-eighth-inch thick, on top. Secure everything using screws torqued straight into holes on the concrete. The finished product is a dry sub floor. 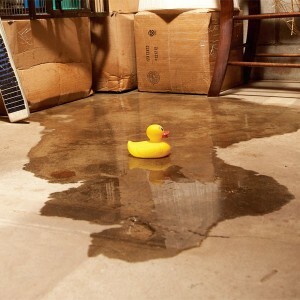 But just because you have a wet basement floor doesn’t mean it’s only the floor you need to check. You also have to see it to it that the walls aren’t leaking. Naturally, with water running through the walls, the entire basement gets flooded, something you should endeavour to prevent. You need to know how to frame a basement wall. Use a foam product with channels for lumber. The wood can serve as a nailing surface for the interior wallboard. Secure with screws. This would act as insulation. Foam is better than fibreglass when it comes to treating a wet basement floor because it doesn’t crack with moisture. But even if a professional repair job can burn holes in your pocket, there are times when it proves a wiser option than the DIY approach. Sometimes the problem is too severe to solve with simple home remedies and in order to save your house you need to call the experts. This is imperative when you find white mold in basement, or mold in any colour for that matter. Mold translates to constant wetness. This means that the problem runs deeper–you may have to fix an old sump pump or install a new one, or modify or install a french drain to keep a wet basement floor dry once and for all. These are things you shouldn’t do on your own, especially if you don’t have an inkling as to how these equipment work. Whatever method you choose, whether you opt to go DIY or call the pros, bear in mind that fixing a wet basement floor entails spending a considerable amount of money. Instead of seeing it as a burden, consider it as an investment to keep your house’s value up and your family safe.